Yesterday I ate a whole tub of salsa from Whole Foods! Without chips! And shockingly it agreed with me. During our juice fast we were preparing “salsa juices” throughout the week. Usually we drink fruity juices. But, for some reason on this particular juicing round we were craving something spicy and garlicky. Our favorite juice was, what we like to call “salsa juice”. Tomatoes, cucumber, red onion, garlic, cilantro, jalapeño and lime. Now we are eating again and this meal is a very nice way to ease our system back into the swing of things. The garlic, ginger, cilantro flavors are very subtle and clean. I think this would be even better with a drizzle of olive oil and a few shakes of salt. If you are not using a food processor finely chop all ingredients, otherwise place in a food processor and whizz until finely chopped. 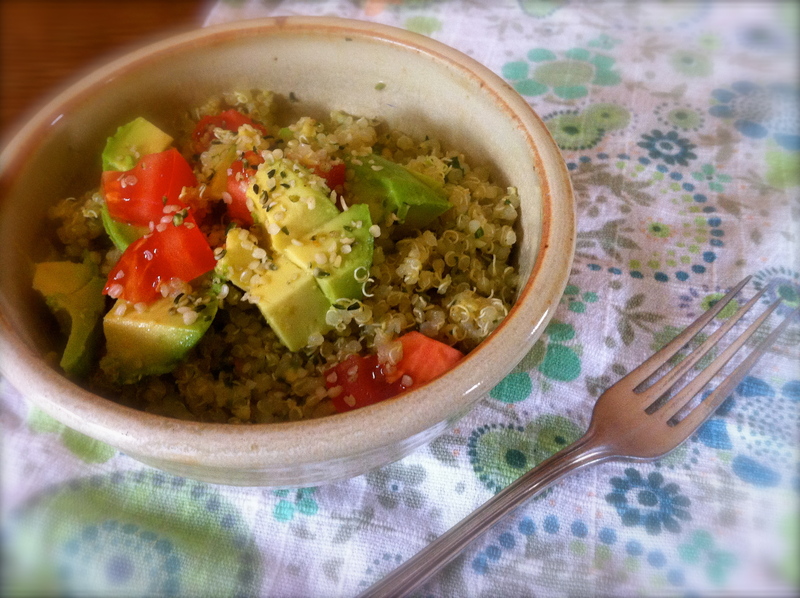 Toss with quinoa and serve alone or topped with a little diced tomatoes, avocado and sprinkle with shelled hemp seeds. This is wonderful, it’s fantastic when a healthful meal is not only beautiful but tasty as well, Love this! You are currently reading quinoa at COTTAGE GROVE HOUSE.